This blog is not for people who are crazy about cooking. It is not for foodies who own mandolins and wok skimmers and nutmeg grinders, and who will happily go to any lengths to find Chaockoh coconut milk or Mae Ploy Thai red curry paste. This is a blog for those of us who are intimidated by the foodies, those of us who might not actually like to cook all that much and would rather keep working or go hiking or to the movies, or most anything outside of the kitchen. But we love our friends and families and want to see them in person, hang out, talk to them, and invite them over for a meal. You know those photographs in food or shelter magazines where everybody’s in a grape arbor or a country garden, sitting around a long table having a huge meal together and laughing? There’s wine and sun (or candlelight if it’s evening), and usually a dog or two lounging under the table, and everyone looks like they’re having the best of all possible times. This is my fantasy for having friends and family over. Delicious food, good talk and laughter. But somebody’s got to cook all that food on the table, and if it’s my friends out in the garden I want to be with them, with the dogs, the wine, the good conversation, the fun, and not in the kitchen. For the past few months I’ve been collecting new recipes, tweaking some old ones, and asking friends to send me their favorite, easiest dishes. I’ve invited friends and family over to be my guinea pigs. They rate the food from 5 (fantastic) down to 1 (never serve this again), and only the 5’s will be posted on this blog. Oddly enough, I now find myself getting excited about cooking. I spend time at T.J. Maxx buying kitchen utensils or on Amazon ordering small appliances like a rice cooker and a blender. And I just bought my first vegetable peeler. So, welcome to my cooking blog. Every week I’ll post a new recipe – dinner, lunch/brunch, or some incredibly easy party dish, along with some thoughts and experiences with cooking (such as the time I caught my hair on fire basting the Thanksgiving turkey.) And if you have some simple delicious recipes please pass them on. 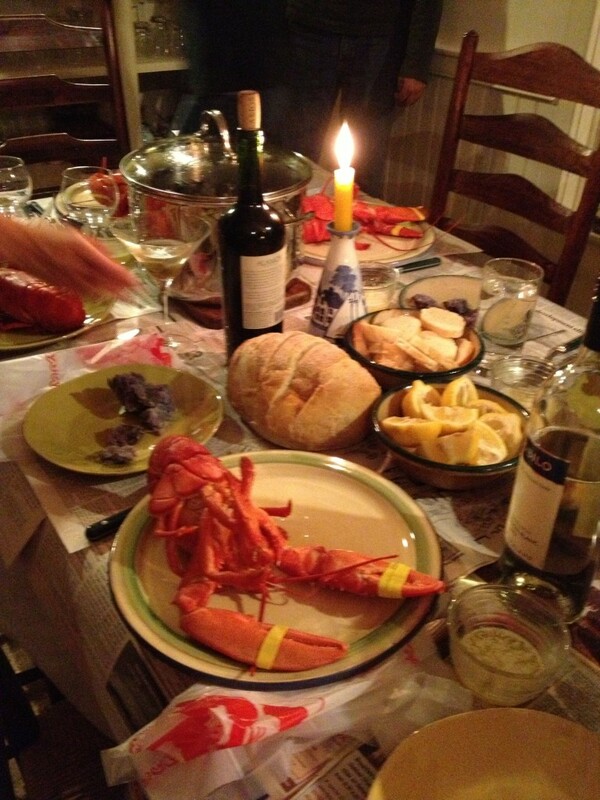 Above: Family lobster dinner in Islesboro, Maine during the wedding week of my niece.